Today on the Blog I'm looking at the journey of Melanie Lissack, influencer, interior designer, Amara award winning blogger and public speaker. Melanie began her blog, almost as a sanity following redundancy, and this has led to her having a number of interiors projects on the go plus a career in interior decorating and styling which she now spends most of her time doing. A fascinating story of how grabbing onto something new at a time of change can lead to such success, go and find out how Melanie does it all. Melanie's Award Winning Blog can be found here and you can hear about the many brands she has worked with below. I'm Melanie and I live east of London, right by beautiful Epping Forest with my husband, dog and young son Jaxon. My interest in interiors really reached obsession point when my husband and I brought our first home. I bulk brought all the top name interior magazines to get inspiration for how I wanted our new house to look, but quickly realised that I couldn't afford most of the interior looks & items I lusted after. I love a period setting - wall panelling, heritage paint colours, dramatic coving and salvaged radiators and fireplaces, but interiorly styled with current, cool, exciting products by Jonathan Adler, Tom Dixon, Lee Broom and Philippe Starck. I was determined to fill my home with contemporary, on-trend, modern, quirky interiors. The only problem was the £££££. From that moment on I spent most of my waking hours trying to source, copy or re-create the look on a budget. DIY & decorating started to take over my life as I clambered to achieve a Livingetc. look for less. A house move, combined with a baby and redundancy (I previously worked in the music industry my entire career life) gave me more scope to do LOADS more interior related projects, which resulted in people starting to comment on how I'd designed and put together my home. When I told them pretty much everything in it I'd made myself, or sourced it for a few pounds, was when people started asking me for advice on how they could do this themselves. I therefore decided to start this blog, and out of the blog came the business! 1. You've had an amazing couple of years and your blog is now justifiably recognised in the top 50 blogs regularly, so I'm interested in what got you started with Blogging and on Social Media, which came first and why? About a year before I started the blog we'd moved house from our central London maisonette to a detached house in Essex. The house was gorgeous, yet every room was painted the same cream colour and needed our stamp on it. 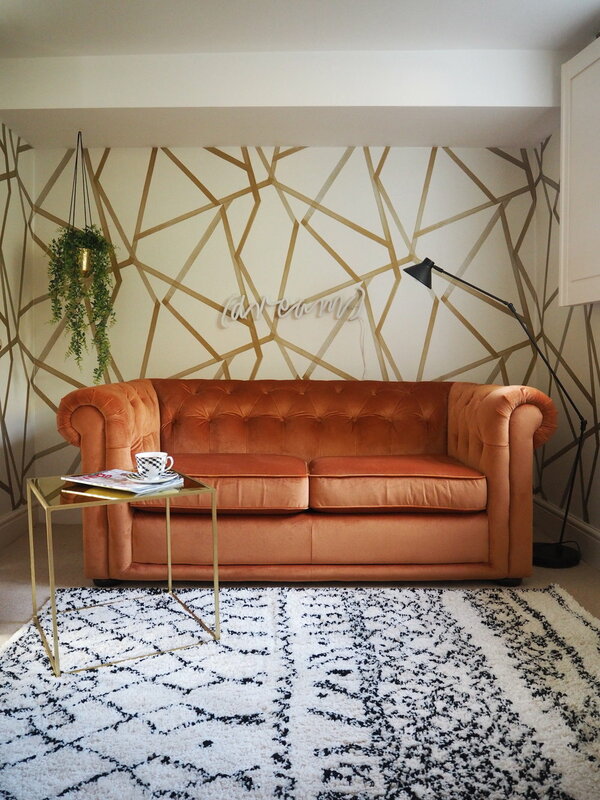 Instagram was getting popular and via Instagram I started following some interior bloggers for a bit of inspiration on how I should approach the redecoration of our new home. From the Instagram posts I started reading the blogs associated before finally deciding to start my own. At that time I massively needed a 'personal output'. I used to have a busy, successful career in the music industry but could not go back to work when I had my son, who had quite a few medical issues from birth, which has since resulted in a autism diagnosis. Blogging in all honesty saved my sanity a bit! 2. Do you blog full-time or mix it with other jobs? I have my finger in a lot of 'interior-pies' which has all come about from the blog. I'm now a freelance interior stylist and decorator which is what I spend most of my time doing. A lot of people contact me via the blog looking for affordable interior design. I then work with them re-doing rooms in their home from start to finish. I'll design the room, suggest furniture, purchase it all, but it if necessary and do all the painting and decorating for them so I'm basically doing the whole thing - like I would in my own home. As well as that I also do public speaking on interiors and blogging. Last year I presented at the Ideal Home Exhibition and Harrogate Home and & Gift Festival. However, I still feel like a full-time blogger as well - I post every week and do a lot of work in my own home to showcase on the blog! 3. How do you juggle it all, especially with a young family? It's really hard and a lot of the time I'm exhausted and on the verge of burn out - I'm not going to lie! This week i've been painting my clients bathroom then coming home and painting my own house in the evening! But I love interiors so much, it's a passion so I'm excited to work each day on anything interior related. I will also be forever thankful that I now have a career where I manage my own diary. There was no way I could go back to a structured office job as my son has so many appointments every week for the various therapists he sees. My husband is also freelance which massively helps. We alternate childcare and plan our weeks ahead with a joint diary. My social media following isn't huge but my blog is really successful and has a lot of traffic. I think that's because I prefer to work on blog content than styling social media posts. Just do what you prefer - growing your blog traffic or your social media presence - both are good things to do. I post regularly on the blog and work hard to get my posts seen by people searching for that topic in Google. The best piece of advice I ever received on blogging is always to think 'what is the reader getting out of this?' People only read blogs if there is something for them to gain out of it, so I always have that in mind when writing a blog post. 5. What Brands have you worked with? Did you seek to monetise your blog or has it been serendipitous? I've worked with Farrow & Ball - last year I created a mood board for one of their new wallpapers which was featured in their Autumn / Winter pamphlet worldwide. It was originally only meant for the UK so I'm really proud they decided to use it across the globe in the end. I'm currently working with Yves Delorme who make the most exquisite bedlinen which is manufactured in France and the embroidery handsewn. I'm someone who has a real DIY attitude to things so I love knowing something is handmade. I've also worked with the Used Kitchen Exchange - a concept I love as its a re-use and recycle business - I hate waste and feel that within interiors you can transform a lot with paint and smaller details, like new hardware. I've also done things with John Lewis, Habitat, Made.com. Eve, Inkmill Vinyl....quite a few now that I think of it! Have a great work ethic, be prepared to work for free (within reason) to gain experience, work hard to the best of your ability, and fake it till you make it. Even if you don't think you are good enough make everyone believe you are the best thing since sliced bead. Also just DM other bloggers for advice. If you think they have done something great just contact them and say 'I love that - how did you do it? Can you help me?' The interior community are the nicest bunch. Jenny from Seasons In Colour helped me out so much when I was starting out, she steered me in the right direction for lots of things. I still always contact others for help. I'm always DMing Bianca from French For Pineapple about how she makes her photography look so good. And I call on Lisa Dawson for advice on pricing jobs!! For me, the hardest is keeping up my social media. I'm not really a 'my whole life on camera' person, but I know how important it is to keep up your online presence with things like Instagram stories. The most rewarding for me is getting to attend lovely events and be sent beautiful products. A fun day out for me is just to wander around furniture shops, now I get to see collections and new designs months in advance. No, but in 2018 I want to win at Pinterest. Over Xmas I had a really popular Pin for a Xmas door wreath and my blog traffic skyrocketed, so I know I need to focus on that this year. Do original content, don't write about the same new collection everyone else is writing about. Write about things you love and your interest and passion will show through which will keep people engaged. Winning the Amara Best DIY blog award in 2016. I'd only been going 6 months and I was shocked to be nominated let alone win. I find it fascinating that Instagram and blogging has, over the last two years, led to so many careers in the interiors space. Most of us blog or use social to fill a need in our life, perhaps a sanity check or as an alternative to a stressful day job and for this to start turning into jobs still seems bewildering to most of us. Yet people want their homes to reflect their personalities and as Melanie says, on a budget that is often small, so why wouldn't they turn to people who can make their own home look good on a similar budget, to teach them how to do DIY and decorate? Like the other small businesses I feature on the blog, blogging and styling is just as challenging, Melanie alludes to how many hours she has to work here and when you earn a living this way you have to put in the hours, sometimes working for free to prove yourself. But like small business owners, bloggers/stylists can work their own hours, manage their own diaries, have the freedom to be there for their family and when you have a passion for what you do, it makes it feel worthwhile.